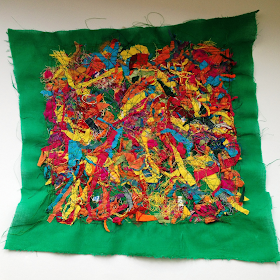 Like all good crafters, I have been saving every scrap from my sewing and embroidery projects. Even the bits of thread and tiniest snippets of fabric. I knew I was saving them for something (stuffing maybe?!) but then I came across this post by Just Jude and I had to try it immediately! The idea is that you can create a fun, new piece of fabric that you can then use for whatever you'd like. Once I had sorted them out, I chose my backing fabric - I went for a bright green to complement all the colours (there was less of the green). I actually experimented with a few including white but the green was my favourite! I then cut a piece of water soluble fabric the same size as the backing piece, and sandwiched the scraps between them. Realising I could have a bigger finished piece if I spaced our the scraps more, I then had to add a couple of cut pieces of water soluble to accommodate for this. I pinned the whole thing together, including through the middle (not shown here but this was needed to ensure that the scraps stayed relatively still) and took it over to the sewing machine. You can do free motion embroidery over this but I was feeling lazy so stuck to a straight stitch with my normal foot. I stitched up and down, side to side in a grid and then did lots of diagonals. Jude suggests to "stitch it within an inch of its life" ! Then its simply a case of running it under the tap to dissolve the upper piece. I was nervous at this stage but it came out fine! I washed it through a few times to get rid of the starchy feeling, and then wrung it out and left it in the sun to dry! And now the hard part, deciding what to use it for. I was thinking it would make a lovely notebook/journal cover. It also makes great iPhone wallpaper!! Do you have any other ideas? Looks like I should have been saving those tiny scraps I have been throwing away! Wow! What a great idea. Where do you get the water soluble fabric? This would look great on a nice pillow cover for my couch! Thanks for sharing. What an interesting idea. I too will have to look out for the water soluble fabric. I always wish when sewing that the fabric were like pastry and you could just ball it up and roll it out again. Fabulous idea - I love it! I may have to have a go - I think I'd make mine into a cushion cover. I think it'd make a great tote bag too. I love new ideas!! Great job! This is something I have just HAVE to try!! Following! Fab idea, love it :) not sure what i would make. 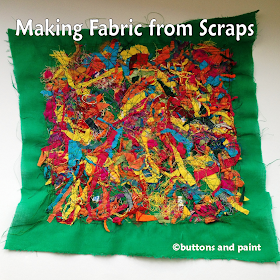 Tho it would be fab for a child, all those textures so maybe as part of a taggie or blanket/quilt. IBrilliant! 've got an overflowing 'odds and sods' box, mainly full of silk snippets! At last I have found a project to do them justice - and they'll look super as a little button hat I think! Thank you! very interesting, I could see these works of art as a wall hanging. You've inspired me to do something will all my scraps from making hundreds of steering wheel covers. Thanks, pinned. So cool. 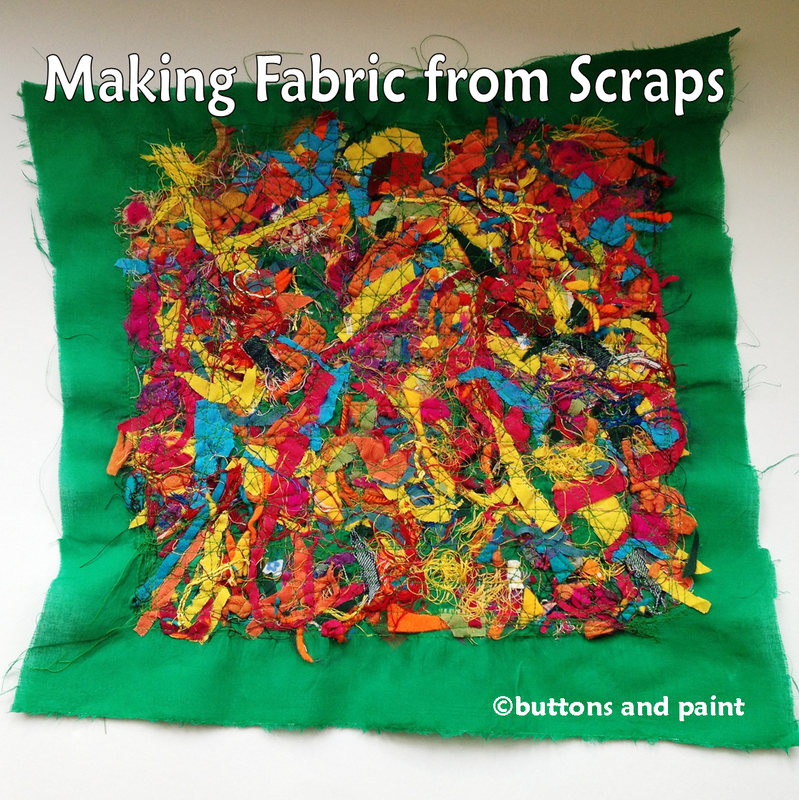 I can't wait to get out my fabric scraps and try this! An amazing idea!! I've never heard about thr water soluble fabric... Thanks!! I have done this technique but without using a backing fabric. It's wonderful to use as you can mould it into shape - so you can make a fabric bowl with it!